Ted Cruz isn’t giving up. While Donald Trump dispatches three advisers to Texas’s convention in Dallas this week and makes a pitch for party unity, his team will be running up against a Cruz operation that is still maneuvering to stuff the state’s delegation with allies the senator could call on to snub the presumptive nominee. “We have a busy weekend planned,” said a source familiar with the Cruz campaign’s plans. 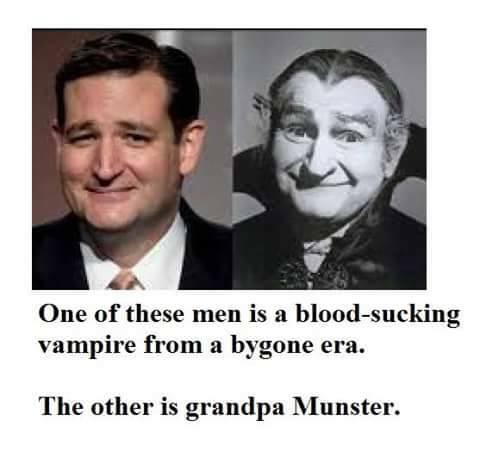 It’s not just Texas where Cruz is still playing. The senator’s team remains active in several of the other eight state conventions selecting delegates this week – from Nebraska to Oklahoma to Nevada. Those conventions, along with party meetings in Arkansas, Florida and Wisconsin, will be selecting 389 national delegates, nearly a sixth of the entire convention. I liked Cruz way back when. Before he started his run for the Presidency. But when he threw his hat in the ring I knew he was not eligible for the office and was lying about it. But I still had respect for his positions. BUT.......He's gone downhill ever since, just keeps getting worse and worse. Now I've lost all respect for him, the man is a true weasel and I'm not trying to insult weasels here, perhaps snake is a better word, but then I'm insulting snakes. That's it: snakeoil salesman, that's what he is. Suffice it to say I can no longer stomach this reprehensible excuse for a man. And the guy is only 45 yo! I mean, doesn't he understand the bigger picture? Evidently not. Lyin Ted is now Desperate Ted and nobody in their right mind, buys what a desperate salesman is pedaling. Saw this the other day and thought it was cute . . .